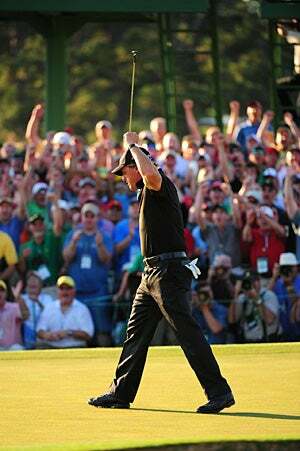 Phil Mickelson was the last American to capture a title, more than a year ago at the 2010 Masters. SANDWICH, England (AP) — Tiger Woods is back home, nursing a sore leg. The rest of American golf isn't doing so well, either. The U.S. is mired in its longest drought of the modern Grand Slam era, having gone five straight majors without a victory. Phil Mickelson was the last American to capture a title, more than a year ago at the 2010 Masters. Since then, it's been two golfers from Northern Ireland (Rory McIlroy and Graeme McDowell), two from South Africa (Charl Schwartzel and Louis Oosthuizen) and one from Germany (Martin Kaymer). While players from all over the world describe the U.S. slump as nothing more than cyclical, Nick Watney concedes that it's getting a bit bothersome. "You never want to hear you're inferior," he said Wednesday. Coming into the British Open, Europeans hold the top four spots in the world rankings. Steve Stricker is the highest American at No. 5. With Woods sidelined by an injury, the 22-year-old McIlroy is a solid favorite to follow up his eight-stroke victory at the U.S. Open with another major title at Royal St. George's. The bookies also like a pair of Englishmen who happen to be 1-2 in the world rankings, Luke Donald and Lee Westwood. Just an afterthought on the eve of the opening round. "In the grand scheme of things, it's not such a big deal. In 40 years time, it will look like a blip," said Padraig Harrington of Ireland, a three-time major winner. "But when you look at the smaller picture, it's easy to say that Europe has become dominant in golf - until you remember that two of those majors were won by South Africans. They're a strong country, too. And I think the next few majors might be won by the Australians." As in many sports, from basketball to tennis to swimming, the rest of the world has sliced into America's once-commanding position. Golf is no different, with 24 nations represented at this seaside course in southern England. Some of them, it would seem, have only tapped into their potential. "Certainly we all expect that in the next couple of decades, Asia is going to have a very strong presence in the game of golf," Mickelson said. But for all the talk about this being more about the rest of the world catching up than the Americans falling off, it's clear the most recent generation of U.S. golfers has yet to fulfill its potential. Remember all the fresh young faces on the team that stunned Europe in the 2008 Ryder Cup, 20-somethings such as Anthony Kim and Hunter Mahan and J.B. Holmes? None of them has broken through in a major, and Kim might be the most mystifying of all. Tapped to be the next great American player, Kim has yet to recapture his swing since thumb surgery and only got into the British Open as an alternate. Another batch of youngsters has shown potential, led by 27-year-old Dustin Johnson. He was leading by three strokes going to the final round of last year's U.S. Open, but an 82 opened the door for McDowell's win. At the final major of 2010, Johnson missed out on a playoff at the PGA Championship when assessed a two-stroke penalty for not realizing he was in a bunker when he grounded his club. Kaymer went on to beat another American, Bubba Watson. "We've got a lot of great young players coming up," said Ben Curtis, who won the last British Open played at Royal St. George's in 2003. "A few of them just need a little bit more experience." Only one other time since the Masters began in 1934 have the Americans gone even four straight majors without a win. That was 1994, when the Americans were shut out by Zimbabwe's Nick Price (British Open, PGA Championship), South Africa's Ernie Els (U.S. Open) and Spain's Jose Maria Olazabal (Spain). That year capped another glorious era for golfers beyond America's shores. Over a five-year span beginning in 1990, non-U.S. golfers won 13 out of 20 majors. All over the world, there were impressionable youngsters who would mature into today's champions. "When you grow up watching guys from your country win majors, it's reasonable to believe that you can win majors when you grow up," Harrington said. These days, the most hyped of the young Americans is 22-year-old Rickie Fowler, who already has played in the Ryder Cup and was the PGA Tour's rookie of the year in 2010. But he's yet to win on Tour and hasn't finished higher than 14th in a major - a resume that pales alongside McIlroy, who's about 5 months younger and already has been at the top of the leaderboard in all four majors. "Everybody is different. Like Rickie Fowler, for example. Is he putting too much pressure on himself? Maybe," Curtis said. "He's a great young player, he's a good kid and you hope one day he'll get a couple of victories under his belt. Once he wins one, he could win 10." McIlroy brushed off any talk about American golf being in decline, even as he seems poised to take over the leading role from a seemingly fading Woods, who hasn't won a major since capturing his 14th title more than three years ago. The former No. 1 has been plagued by injuries on the course and scandal in his personal life. "American golf isn't as bad as everyone is making it out to be," said McIlroy, who will play with Fowler in the first two rounds of the Open. "These things go in cycles. I think there could be a stage in the next year or couple years where you're saying, 'Why hasn't a European won?'" The American with the best hope of ending the major-less streak would appear to be 44-year-old Stricker, who won the Memorial last month and is coming off another victory at the John Deere Classic last weekend. He just hasn't broken through in a major, despite top-10 finishes in all four of the biggest events. "Steve Stricker seems to be winning every other week," said Davis Love III, who will be captain of the U.S. team at next year's Ryder Cup. "Americans have been winning a lot of big tournaments lately - just not the majors." Of course, those are the wins that everyone remembers.